Retired Pandora Dice Charm - RARE! It is 100% Pandora authentic with (s)925 ALE stamp on it. The good luck Pandora Silver Dice Charm is a fun addition to any Pandora collection. Crafted and hand finished in sterling silver, the lucky dice is a standard six sided design with engraved spots on each face of the cube. 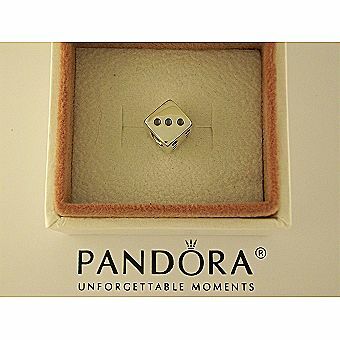 Pandora beads are designed for you to remember your special moments, celebrate events and mark occasions. Wonderful beads for any occasion, show, commemorate and celebrate your love with Pandora. Essentials Crafted from sterling silver. Part of the Moments collection.